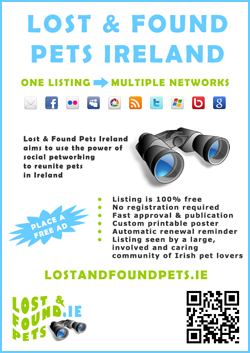 We’re delighted to welcome you to the new Lost and Found Pets Ireland blog. Originally we hadn’t planned to do this but during the site build and in the couple of weeks since the site went live we’ve realised that there was a need for it. To serve as an online platform for those involved in dealing with the problem of lost and abandoned pets in Ireland. Often those involved are single individuals or come from small organisations so hard-pressed for resources that their own online presence is minimal. To announce new site features as we roll them out on-site. We do this already via Twitter and Facebook but some features require more detailed discussion than these media can provide. To provide further information on existing site features and offer hints and tips on getting the most out of listings. To draw public attention to and arouse debate around issues which we feel are crucial to the problem of lost and abandoned pets in Ireland such as the importance of centralising data and micro-chipping. We hope you will consider adding our RSS feed to your favourite blog reader and will be providing some tools to help you easily do that over the next few days. We would also like to invite those involved at the coalface of missing and abandoned pets in Ireland including rescues, pounds, charities and other concerned individuals to contact us in relation to publishing articles here. In return for content we offer clean links from a blog with relevant content to the contributors’ chosen site which, as any search engine optimisation expert will tell you, are the most valuable form of incoming links.